For your convenience, the T6i/750D offers Live View, a feature that enables you to use the monitor instead of the viewfinder to compose photos. For still photography, you can use Live View in any exposure mode except the Candlelight Portrait scene mode. For movies, you must use Live View; the viewfinder is disabled for movie recording. Before you can use the monitor to compose your images, you must set the Live View Shooting option to enable. Why disable this menu option? Because it’s easy to hit the Live View button accidentally and switch to Live View when you don’t really want to go there. Live View for still photography: After enabling the feature on the menu, press the Live View button (on the back of the camera, just to the right of the viewfinder). You hear a clicking sound as the internal mirror that normally sends the image from the lens to the viewfinder flips up. Then the scene in front of the lens appears on the monitor, and you can no longer see anything in the viewfinder. Data representing certain camera settings is displayed over the live image, as shown here. You can press the Info button to change the type of data that appears. To exit Live View mode and return to using the viewfinder, press the Live View button again. In Live View mode, picture data is superimposed over the live preview. When looking at Live View screens in this book, you’ll notice that data along the bottom of the screen appears differently on your monitor than it does in the figures. In the figures, this data displays against a black background, but on your screen, it’s superimposed over the image. The placement of display data at the top and sides of the screen looks a little different too, but not by as much. The difference is due to the technology used to capture the image that the monitor displays; it’s not possible to capture the superimposed data properly. Live View for recording movies: To shift to Movie mode, rotate the On/Off switch on top of the camera to the movie‐camera icon. Live View engages automatically, and you then press the Live View button to start and stop recording. To exit Movie mode, move the On/Off switch to On if you want to begin shooting stills or to Off if you’re done shooting. In many ways, shooting photos in Live View mode is the same as for viewfinder photography, but some important aspects, such as autofocusing, work very differently. 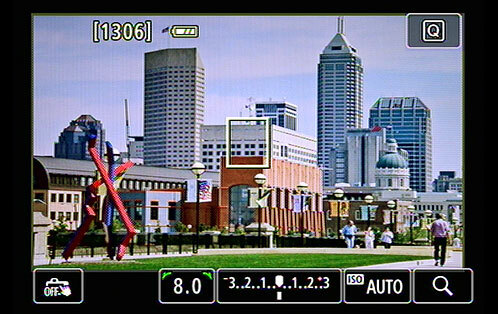 For example, if continuous autofocus is enabled, you can set focus by simply touching a spot on the monitor. You can also use a feature called the touch shutter. When using the touch shutter feature, you touch the monitor to set the focus and take the photo. The camera focuses and releases the shutter immediately after you tap the screen.